We are committed to the most efficient and safe flight training experience possible. Our mission is to open the doors for students that have the desire and passion to fly. Our aircraft have the latest in avionics technology to ensure our pilots have all the resources available today. Signup to get periodic email updates from Crosswinds Aviation and receive $20 off your first 1 Hour Flight! Conveniently located at Howell (KOZW) and Pontiac (KPTK) Airports! We utilize aircraft with the latest in avionics technology to ensure our pilots have all the resources available for reduced workload and good decision-making. Our aircraft are also maintained and cleaned to the highest possible standards to ensure minimum distractions. Why should you fly with us? Imagine getting your private pilot’s license in just three to six months… and doing so with the safest planes in the world. Our avionics, which are installed on all of our aircraft, create the highest degree of situational awareness available today. Our organized syllabus gives you step-by-step directions with video and textbook training to help you become a successful pilot. Whether you are flying for recreation or as a career, learn comfortably, on your own terms, on a schedule that fits your own. Our instructors are experienced professionals with an array of impressive credentials and thousands of hours of flight instruction given. We provide the highest level of flight instruction and aircraft rental, in clean, new aircraft to provide the safest and most economical way to fly. Our High School Flight Training Program has been a tremendous experience. Our mission is to open the doors for students that have the desire and passion to fly. Our goal is to bring awareness and a structured, affordable solution for students that want to get their private pilot license before continuing on to a collegiate aviation program. Thank you so much. I had not found a flight school I felt comfortable at. When I met you, your lovely wife, and Scott, I knew I wanted to continue with all of you. You all have made me feel so welcomed and have facilitated me on everything. It feels very nice and comforting knowing you all genuinely care about aviation and your students. I feel honored to fly there. If you’re thinking of learning to fly, you’ve probably looked at more than one place and are going over your options. Take a discovery flight with Crosswinds, and every other place you go will feel like they’re stuck in the 20th century. The difference in price is definitely worth it to fly modern planes with talented, caring instructors that do it because they care, not because they have nothing better to do. Congratulations Benjamin on your first solo flight! 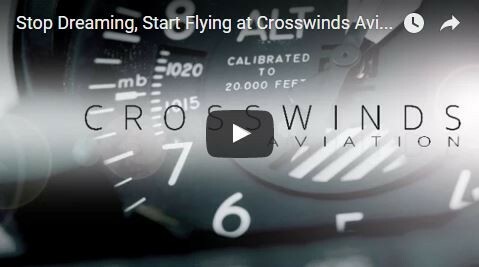 Thank you for choosing Crosswinds Aviation to learn how to fly! Congratulations Kyle on receiving your Private license! Thank you for choosing Crosswinds Aviation to help in your accomplishments! Congratulations Jessy on your CFI! The Crosswinds Aviation team is thrilled to have you learning how to fly with us, and even more thrilled to have you join the Howell team! Jessy is now available on our scheduler!